This course prepared by natives is exactly what you need to improve your Spanish! Ever wonder how to say something in Spanish language ? Make sure you don't ask this question ever again! Our course includes over a 1000 Spanish vocabulary flashcards which will help you on your journey of studying Spanish. Learn new Spanish words all the time and remember more Spanish nouns and verbs . We've divided them into lists by topic for better and quicker results. With over 400 million native speakers, Spanish language is 2nd most popular in the world. Learn over a 1000 Spanish words with our Spanish vocabulary flashcards to make sure you understand the language millions already speak! The course id divided in lists by topic so that you can learn all those Spanish nouns and verbs quickly and efficiently. Hit Spanish A2 easily with our course. More than 1000 Spanish words carefully selected and divided into lists by topic by professionals to ensure more efficiency. 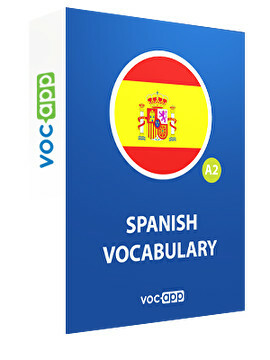 Broaden your Spanish vocabulary using our Spanish vocabulary flashcards and up your game. Learn new Spanish nouns, adjectives and verbs everyday, remember them forever and speak just like the locals do!